If you’ve been into any part of science fiction culture, you know that lasers have been used for everything. While the movie scene poses lasers as a powerful superweapon, they are gaining popularity in medical practices across the globe. Lasers offer significant advantages in many different medical fields, and dentistry hasn’t been left in the dark! The word laser is an acronym. Laser stands for light amplification by the stimulated emission of radiation. What this means in practice is that a machine focuses light energy into a very narrow and focused beam. When this light encounters an obstacle, like diseased tissue in your mouth, it produces a reaction that can remove or shape that tissue. The use of lasers in these applications has allowed for therapies to be more beneficial for both patients and dentists. The process of using lasers has been a practice that has been approved by the Food and Drug Administration or FDA for several different types of procedures. There are generally two types of approaches when using lasers for dental work. These types vary based on the surfaces that they are treating. Dentists have broken this into hard and soft tissue treatment. Cavity detection – lasers are used to help identify cavities and locate underlying early tooth decay. Tooth preparation and dental fillings – Traditional dental practices require a local anesthetic and drilling in order to prepare teeth and fill cavities. Lasers have helped to eliminate the need for either of these. 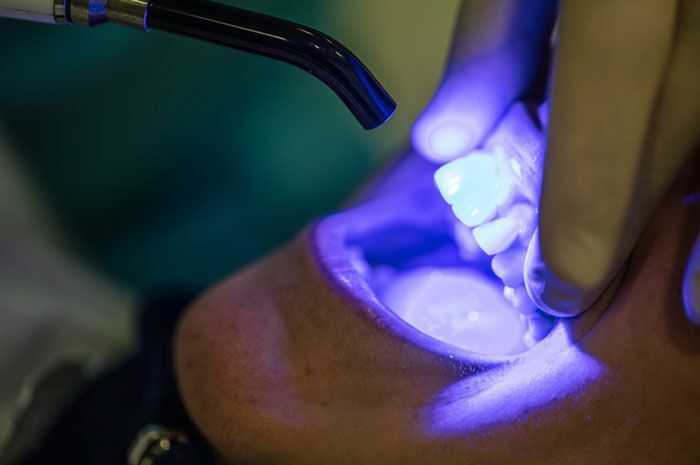 Lasers can be used to kill the bacteria that resides inside of cavities without the need for anesthetics. Treating tooth sensitivity – lasers have been used to treat the sensitivity in teeth by sealing tubules on the tooth’s root. Gummy smiles – if your gums cover too much of your tooth, or the alignment of your gums is different for different teeth, lasers can help to reshape the gums and give you an even beautiful smile. Lengthening your crowns – lasers can be used to help reshape the gum and tooth shape to give a more even smile. Dentists also use lasers to prepare teeth for the placement of restorations on the tooth. Frenectomy – Patients who are tongue-tied often have an issue that is associated with the muscle attachment underneath the tongue. This muscle is called the frenula. Lasers can be used to reshape the muscle attachment. This helps to free the tongues movement so that speech patterns can adequately develop. Patients who have issues with the frenula may also suffer from an inability to breastfeed too, so catching it early can be imperative. Achieve a good denture fit – The soft tissue that underlies a denture can often cause the denture to slip or fit poorly. Laser treatment can help to trim this excess skin, or the folds in the gums to help dentures fit more tightly. Patients that have properly fitting dentures can speak, eat, and even breathe more easily. Teeth whitening – Laser therapies can be used to remove stains from the teeth and improve the appearance of white teeth. This therapy is used in conjunction with whitening formulas because lasers act as the catalyst for the whitening treatment. You may have thought that lasers didn’t belong in your dentist’s office, but they have been there for decades now. Lasers offer patients a more pain-free and effective treatment for a variety of dental treatments. If you are interested in laser therapies, schedule an appointment with your dentist today.